France, one of the biggest European countries, is a wonderful and varied holiday destination. France has plenty to offer, from skiing holidays over the winter months, to glorious beach holidays during the summer. It is also wonderful for romantic breaks away and cultural trips, as well as trips exploring its vast countryside. Important: In the event nobody is available to sign for the shipment at the delivery address in France, the consignment may be left at a local service point for collection (usually located within a local shop or post office). If it is not convenient to collect the shipment, Send My Bag will arrange re-delivery, the re-delivery process may take an additional 24-48hrs. What can I send to France? What items are restricted? Ensure you include the full address in France, including the street name. Standard services are not available to all Ski resorts, contact us for more info. Shipping to France is a great advantage if you have heavy, bulky baggage or equipment. Whether you have skiing gear, walking or sports gear, or just extra items necessary for a long visit, or indeed if you are relocating to France, our door to door service is just what you need. You don’t need to worry about lugging heavy luggage on the train, or carrying lots of bags off the ferry, nor will you have to suffer excess baggage fees on budget flights. Instead, we take care of your luggage for you. Send My Bag can pick up your baggage and bulky equipment from your home and have it waiting for you at your accommodation in France. France is a popular destination for international students deciding to study abroad, or for those completing a term of study under the Erasmus scheme. Students can use Send My Bag to ship their possessions to France, thus allowing them to quickly set up home abroad. It also means they can bring with them many more items than they could take on a plane, and they can ship it all back home again when term ends. You can also send a parcel to France with Send My Bag and send a care package home, or have forgotten items sent to you in France. You can send your luggage and boxes to France with Send My Bag. If you are taking a short city break in one of France’s stunning cities, if you are working there for a year, or if you are moving there permanently, you can save yourself a lot of stress by sending your possessions with Send My Bag. This will make setting up home in France a whole lot easier. You can also enjoy your journey to your new destination, assured in the knowledge that your possessions are being looked after for you. Send My Bag has numerous international routes, with a great-value flat rate for each route up to a massive 30 kg. This means that you can bring all your prized possessions with you to help you set up home abroad. To learn more about sending luggage to France, visit our ‘How it works’ page, or our ‘FAQs’. France is very popular with holidaymakers due to its golfing opportunities. The country has numerous world-class golf courses, such as Morfontaine, Les Bordes and Chantilly. You can easily send your golf clubs to France with Send My Bag and so avoid any oversized baggage fees your airline might impose. You will be grateful that you have your own golf clubs in France with you, rather than having to borrow some, so consider sending your golf clubs to France with Send My Bag. Make sure you find out how to best package your items when you send golf clubs to France. You can send your bicycle to France with Send My Bag and cycle through any number of stunning landscapes in France, such as the Dordogne, Brittany or Provence. You can have your bike sent to your first hotel, cycle through France for the duration of your holiday, and have your bike picked up again at your final hotel. Sending your bike to France is so much easier than checking it into the hold of your plane. Your bike will be waiting for you at your accommodation in France and will arrive back at home with you shortly after your return. Your bike will need to be taken apart and properly packaged before being sent to France. Check out our bike shipping information to find out more. France has many popular ski resorts, such as Courchevel and Val Thorens in the Alps and Val d'Azun in the Pyrenees. If you send your own skis with Send My Bag you won’t need to use rented skis when you are there. It is easy to send your skis, just make sure they are packaged up well and read Send My Bag's information on ski shipping to learn about how to package your skis for transit, safely and in line with regulations. If you are attracted by France’s beautiful countryside and good wholesome food and are moving there permanently, you will have to consider international removals to France in order to transport all of your possessions. Before you hand over anything to the movers, however, ensure that all your items are well packaged so that they won’t get damaged in transit. If moving to France to study for your degree, or if you are taking part in the Erasmus scheme, or other type of third year abroad, you will need to bring lots of your possessions with you to help set up home in your new accommodation. Apart from everyday essentials you will also need to bring reading material for your course, or, if working as a language assistant, you will need materials to help you create lessons. Plus you will need items like DVDs and books to help you pass your free time. Top-ranking universities in France that you might choose from include the École Normale Supérieure, the École Polytechnique and Paris-Sud University. To find out more about student shipping to France visit our student shipping page and get your 10% student discount. Send My Bag can send parcels to France for you. You can ask a friend or family member to send something to you that you have left behind. Or they might want to send you a care package to France to help remind you of home, or even a gift at Christmas or for your birthday. This is a great idea for expats who have relocated to France or for students on their year abroad who are feeling a bit homesick. Send My Bag can send parcels internationally to France for you. Make sure you choose a quality, hard-wearing box when sending a parcel to France and tape it up well so nothing gets damaged in transit. Also make sure you are aware of rules regarding personal effects and brand new items (see below). Make sure you find out more about how to send a parcel with Send My Bag and how to package your items. Air freight is one option for sending big bulky items, such as a sofa or armchair, to France. Sending items by air freight usually takes one to two days. The amount you pay depends on the weight and size of your shipment. You will probably also have to use the services of a customs agent to handle customs clearance for you. And, you need to get your items to and from the airport, so costs can add up quickly. If you send internationally by air freight to France your items will likely arrive at one of the major airports, such as Paris Charles de Gaulle Airport or Marseille Provence Airport. Alternatively, you could choose sea freight or container shipping to transport your possessions to France. This is a good option if you don’t need to receive your items immediately. Again, this option is usually used when shipping large bulky items, such as a canoe or a car. Sea freight usually means shipping items in large containers loaded onto cargo ships. It can be cheaper than air freight, but you will still need to use the services of a customs agent and will need to sort out how to get your items to and from the ports. When using container shipping to France your items will most likely arrive by ship at one of the major sea ports, such as Le Havre, Marseille or Bordeaux. Easy, fast and respectful of your personal belongings. When shipping to France, a packing list must state clearly ‘Personal Effects’. A customs inspection will take place upon shipment’s arrival in France. No duties or taxes are expected if customs officer deems shipment to consist of Personal Effects. A photocopy of the consignee’s passport will be required which can be uploaded in your Send My Bag account. Personal effects are defined as used items which have been in the sender's possession for 6 months or more. If your bag is checked by French customs and is found to contain brand new or commercial items your shipment may be assessed for customs duties and taxes. Keep this in mind if you are sending Christmas gifts. Please check with French customs so you are aware of potential customs duties, follow any advice given and attach all necessary documentation. As customs processes and allowances vary by country, we advise all travellers take 5 minutes to check how their personal circumstances and what they are sending will be assessed under the prevailing customs regulations of the destination. In order to demonstrate that your shipment consists of personal effects, you will be required to complete a brief non generic packing list online, entries to be made in the format: "5 x Cotton Dresses, 2 x Jeans, 3 x Pair of Gloves", and so on, rather than as "10 x Used Clothing". France allows gifts up to a maximum value of €45 to enter the country without duties and taxes being applied. If the value exceeds the €45 threshold, duties and taxes will be applied to the entire shipments value and not just the portion that exceeded the gift limit. Vitamins and all other health and nutritional supplements. The climate in France varies according to region. In the winter months in the Alps, the average temperature is -2° C, but on the south coast the average winter temperature is a much milder 9°C. In the summer the hottest areas are in the south. The Dordogne, for example, sees average summer temperatures of 29°C. Paris – the country’s capital city – is one of the most popular destinations in France. 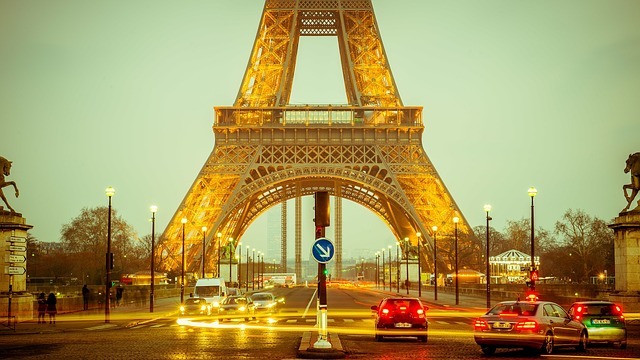 It is steeped in history with many famous sites to see, including the Eiffel Tower and the Louvre. The cosmopolitan city of Nice on the Côte d'Azur is a fantastic destination in its own right, but is also the gateway to the South of France, which covers glamorous destinations such as St Tropez, Cannes, and Monaco. If you’re heading to these fabulous destinations, you will need extra baggage, for all those extra outfits and accessories you will need to take with you! During the winter months, France is a haven for skiing, with a number of world class resorts tucked away in the Alps. Some of the best ski resorts include: Courchevel, Val d'Isère, Tignes, Méribel and Chamonix. All offer a wide range of ski runs, covering beginners to experienced skiers and snowboarders. You can also take part in alpine activities including non-skiing activities, such as snowshoe wildlife safaris, paragliding and ice-climbing.